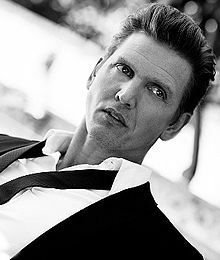 Barry Robert Pepper (born April 4, 1970) is a Canadian actor. He played Private Daniel Jackson in Saving Private Ryan (1998), Corrections Officer Dean Stanton in The Green Mile (1999), Jonnie Goodboy Tyler in Battlefield Earth (2000), Roger Maris in 61* (2001), Sergeant Michael Strank in Flags of Our Fathers (2006) and "Lucky" Ned Pepper in True Grit (2010). He has been nominated for three Screen Actors Guild Awards and a Golden Globe Award. For his role as Robert F. Kennedy in the miniseries The Kennedys (2011), Pepper won the Primetime Emmy Award for Outstanding Lead Actor in a Miniseries or Movie. Pepper was born the youngest of three boys in Campbell River, British Columbia, the son of a lumberjack. When he was five years old, his family set sail in a homemade ship, navigating through the South Pacific islands for five years. His education was completed in both public schools and correspondence courses. Due to the lack of television as entertainment, the family created and performed sketches for each other. When the family had finished their travels, they returned to Canada and set up a shop on Denman Island. Pepper is perhaps best known for his role as the sniper Private Daniel Jackson in Saving Private Ryan. He portrayed Corrections Officer Dean Stanton in The Green Mile, appeared as Frank Slaughtery in Spike Lee's 25th Hour, as journalist Joseph L. Galloway in We Were Soldiers, his role as the heroic antagonist of the film Battlefield Earth, his depiction of Roger Maris in Billy Crystal's HBO film 61*, as Dale Earnhardt in the ESPN produced film 3: The Dale Earnhardt Story, and as Dan Morris in the film Seven Pounds, with Will Smith. He recently had roles in Casino Jack and the Coen brothers' True Grit. Pepper provided the voice for Alex Mercer, the protagonist of the video game Prototype and the voice for Corporal Dunn, a character in the video game Call of Duty: Modern Warfare 2.
Pepper won the Razzie Award for Worst Supporting Actor for his performance in Battlefield Earth: A Saga of the Year 3000. He has stated that, had he known in advance he was going to win the award, he would have gladly accepted it in person. Pepper will star in psychological thriller Frost Road which is being directed by Call of Duty director Keith Arem. He also appeared in Jagged Edge's music video for "Goodbye". In 2011, he starred as Robert F. Kennedy in the Canadian-American TV mini-series The Kennedys, for which he won the Primetime Emmy Award for Outstanding Lead Actor in a Miniseries or Movie. In 2015, Pepper appeared in The Maze Runner sequel, Maze Runner: The Scorch Trials, as Vince, "a survivalist who is one of the last remaining soldiers of a legendary unit called the Right Arm". Filming began at the end of October 2014, and the movie was released on September 18, 2015. 1994 Neon Rider Jason Episode: "The Secret Life of Garret Tuggle"
1995 Highlander: The Series Michael Christian Episode: "They Also Serve"
1995 Sliders Skidd Episode: "Summer of Love"
1996 The Outer Limits Tyson Ruddick Episode: "The Heist"
1996 The Sentinel Kurt Hessman Episode: "Payback"
^ a b Portman, Jamie (2006-10-30). "Vancouver actor inspired by fatherly Clint Eastwood". The Ottawa Citizen. Archived from the original on 2012-11-09. Retrieved 2010-12-17. ^ Staff (30 March 2001). "Barry Pepper amused by his worst supporting actor award for Battlefield Earth". The Canadian Press. ^ Borys Kit (November 3, 2014). "Barry Pepper Joins 'Maze Runner' Sequel 'Scorch Trials' (Exclusive)". hollywoodreporter.com. Retrieved November 4, 2014. ^ "Barry Pepper, Michael Sheen & Amanda Peet Also Cut From Terrence Malick's 'To The Wonder'". The Playlist. 2012-08-29. Archived from the original on 2012-09-01. Retrieved 2012-08-30.